An excellent resume is key to a successful job search, especially in a job market as competitive as today’s. One of the challenges is describing your skills and career experience in a way that relates to the requirements in the job description and separates you from other candidates. As a veteran, you have military experience that's helped you hone highly marketable skills; all you have to do is figure out how to translate those skills for a civilian environment. You can improve your resume-writing skills by reading industry-specific advice and studying high-quality examples. This guide can give you all the tools you need for success. You can use the veteran resume templates to find samples of strong formatting inspiration for your own content. A final copy that showcases your unique qualifications is ready to make an impact on potential employers. Why Use Veteran Resume Templates? Comparison tools: If you're revising or updating your existing resume, you can compare your document to resume templates to verify the format and content. Use a template to make sure you've included all the important skills and used standardized professional language. While many resumes stick to a chronological format, a functional resume may work better for a veteran. Veteran resume templates with skills-based formats focus mostly on capabilities and achievements rather than specific responsibilities at previous positions. You can draw attention to your relevant qualifications, so a hiring manager can clearly see the benefits you'd bring to the company. If you're applying to a startup company or one that prides itself on being unique, you may want to veer away from a classic resume template in favor of a creative modern document. Modern veteran resume templates can show you how to make your document memorable. Use an updated font and focus on your most relevant and impressive skills in a way that stands out at a quick glance. One common mistake some jobseekers make is trying to stand out from the competition with a non-standard resume. However, a clear and easy-to-read format makes a better impression than unprofessional fonts, unrecognizable section headers, and uncommon formatting. Refer to simple and clean templates to make sure your document is concise and attractive. If you're transferring to a civilian job after serving in the military, it's essential to show how your experience translates to the field you want to work in. Study veteran resume templates to learn how to describe military accomplishments in civilian terms. A strong objective statement at the beginning of your resume can describe your goals for the transition and help a recruiter see that you're prepared for new job. 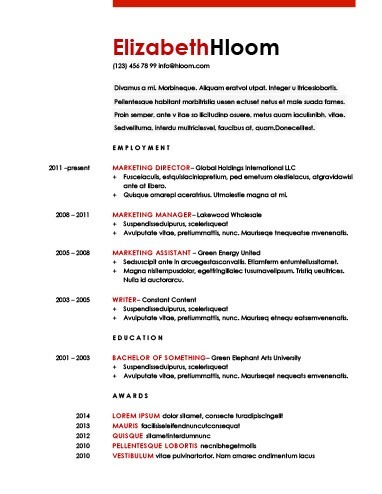 Sometimes, you need more than a single page to create a solid resume. 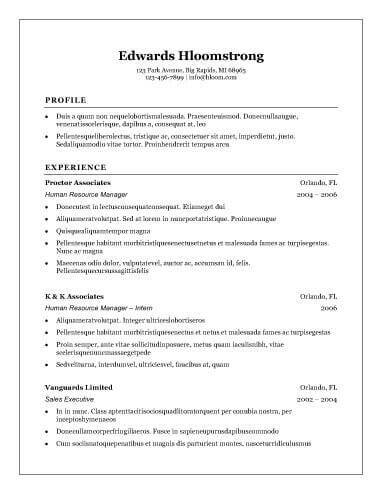 Use longer veteran resume templates if you have enough relevant material to cover over half of the second page. You can also use a two-page resume if the job description requests one. Upper-level resumes for senior positions may require two pages to cover everything listed in the job description. After you've looked through several veteran resume templates to determine which format works best for your purposes, it's time to fill in the outline with your information. These writing tips for each section can ensure your final draft is ready to impress. Name: Use your full name but avoid titles unless they are relevant to the job. Phone Number: Don't list a work phone number. Use a home or cell number instead. Email Address: Are you still using an AOL address? Make a good impression with a professional address on a current server. Address: You can just include your city and state if you don't want to share your full street address. The beginning of your resume is arguably the most important part. It should set the stage for the rest of the document and encourage the reader to continue on down the page. You should open with either a professional summary or objective statement. Objective Statement: Although some employers consider the objective statement outdated, it can work well for veterans, especially those transitioning from the military to the civilian workforce. Use confident language to state your desire and preparation for a job in this new career field. Summary Statement: A professional summary is great way to illuminate your most relevant and impressive qualifications. Use three sentences of bullet points to convince the reader that you're the perfect candidate for the job. Curate the List: While you may have excellent marksmanship, you should only list skills that relate directly to the job for which you are applying. Keep It Short: This section should be easy to skim; edit your list down to between six and eight top skills. Meet the Requirements: The job description can give you a good idea of the qualifications the employer values. Tailor your list to match these requirements, and describe your skills using terms from the job listing. Title and Employer Information: While you should list your military experience and rank, try to avoid using uncommon acronyms or terms a civilian wouldn't understand. Valuable Work: Use your work history entries to showcase your meaningful contributions to your unit and/or previous employers. You don't have to detail every task. Rather, use approximately five bullet points to show how your actions lead to success and supported the mission. Degrees: You should include formal degrees, but you don't need to list your GPA or individual classes. Professional Education: You can also include relevant military training or certifications. Leadership development courses can be strong additions to this section. Use our resume builder to craft your document and feel confident that your application is ready to impress potential employers.